This is one of my favourite soups. I am not normally a fan of tomato soup, but this one is different. Actually this is the only tomato soup I enjoy eating. 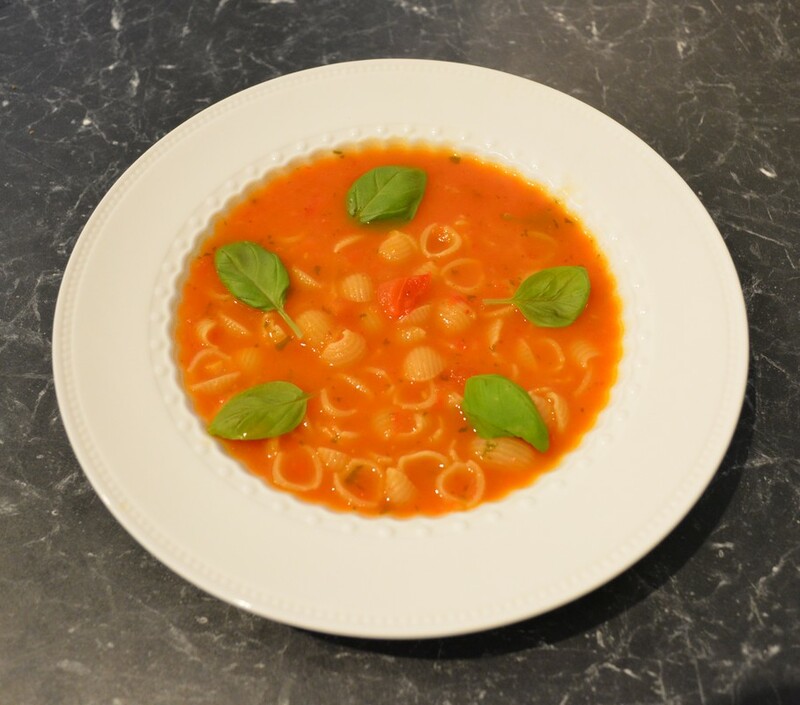 It is quite quick to make for a soup, as it is ready in just over 30 minutes, and what I love is that it is made with fresh ingredients. If you have made your own stock, great, otherwise packet works just fine. You can serve it with some toasted bread that is rubbed with garlic and drizzled with olive oil, and then you don't need to eat anything else. First skin the tomatoes. Cut a small cross in the top of each tomato. Place the tomatoes in a bowl and cover with boiling water for about 1-2 minutes. Drain, cool and peel away the skins from the cross down, they should come off easily, discard the skin. Roughly chop the flesh. In a large saucepan add the oil and heat over a medium heat. Add the onion, garlic and capsicum. Sauté for 10 minutes, stirring regularly, until all the ingredients are soft. Add the tomatoes, cook, stirring, for another 10 minutes. Add the tomato paste, stir through. Now add the stock, salt, pepper, chilli and sugar. Cover, bring to a boil, reduce heat and simmer for 15 minutes. Cook the pasta separately in boiling salted water, drain. Remove from the heat, add in the basil leaves. Using a stick blender, blitz it up. (I like to leave a few chunks in the soup, not make it too smooth). If you don't have a stick blender, allow the soup to cool slightly, then process in batches in a food processor or blender, then reheat if needed. Add the pasta to the soup, sprinkle over some extra basil leaves. Serve hot.